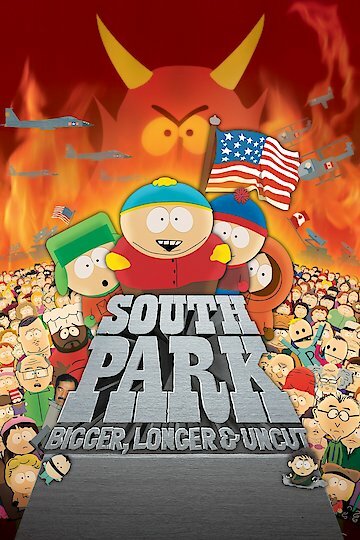 South Park: Bigger, Longer & Uncut is an animated movie created by Trey Parker and Matt Stone based on their television series of the same name. The film encompasses other popular animated movies in a parody that involves crude humor and adult jokes. Despite the film being a cartoon, the movie as well as the Television series is created for mature audiences. The film centers on the boys attempting to view the new Terrance and Phillip movie that has recently been released in their town. Despite possessing enough money for the movie, the boys are turned away due to the fact that movie is rated R, and ironically parallels the same type of crude humor that is portrayed in the actual South Park film itself. In turn, the boys hire a homeless man as their guardian so that they can view the film. After seeing the movie the boys are overcome by the use of foul language that the characters Terrance and Phillip use in the movie, and the boys incorporate their cursing into their own speech despite not quite understanding the meaning of most of the terms. The boys return to school the following day and use the language at the teacher and to other students in the class. Shocked by their kids’ foul language, their teacher and principal attempt to divert their foul mouths by holding an educational seminar to help clean up their newly acquired vocabulary. Their parents also subsequently ground the boys, and Kyle's mom sets up a group called "Mothers against Canada" after attributing the boys’ language to the Terrance and Phillip movie, and based on the fact the characters are from Canada. The characters Terrance and Phillip are arrested due to the ordeal caused by Kyle's mom and the boys find themselves caught up in a struggle to save the men who they idolize so much. In the end the group of boys have to decide between their mother's intentions for them, and following the characters for which they look up to. South Park: Bigger, Longer & Uncut is currently available to watch and stream, buy on demand at Amazon, Vudu, Google Play, FandangoNow, iTunes, YouTube VOD online.